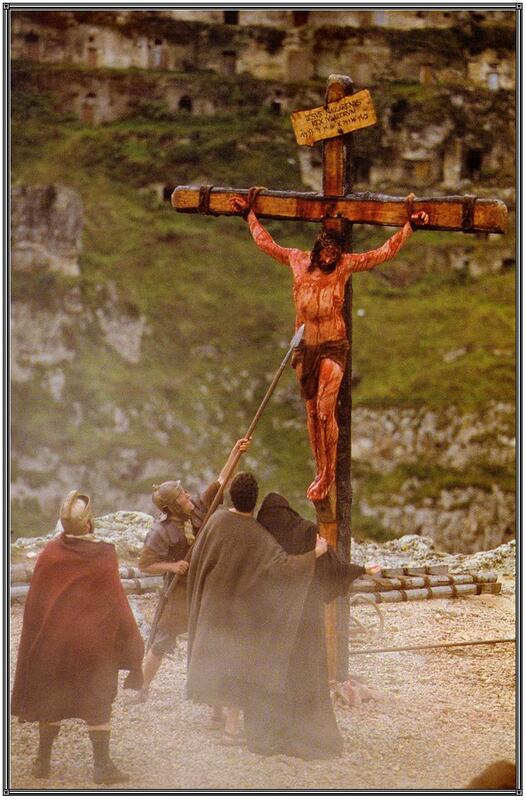 One of my favorite scenes in the epic movie The Passion of the Christ is when the Roman soldier at the foot of the cross pierces the side of Jesus with his lance. That very action — a part of his job to make sure the crucified victim was really dead — changed his life. Recall that the instant his blade cut through the flesh of Jesus, a vigorous stream of blood and water shot out over him. Never again would he be the same. He was an incredibly “lucky” guy. Whatever his past was like, whatever sins or failings he had committed, they were all purified in the saving blood of Jesus Christ, the son of God. Remember the look on his face. His whole expression changed as he fell on his knees, consumed by remorse for what he had done and awed by the realization that he was before an extraordinary God-man, drowned in His merciful love. In spirit we too can place ourselves at the foot of the cross and in this soldier’s sandals, realizing that on this Divine Mercy Sunday in this Jubilee Year of Mercy, we have the same opportunities to be washed clean in the blood of Christ. For us sinners, for us wayward travelers who have succumbed to the world’s allurements, for us fallen-away Catholics, for us lukewarm churchgoers, for us wishy-washy religious, we have a supreme opportunity to reclaim our spiritual heritage as being beloved children of our Heavenly Father. Ah, here is the crux of moving the Heart of the Lord so we can receive the abundance of His mercy: our own hearts must be contrite and sorrowful for our sins and failings. Over and over again, the Scriptures confirm that God will not spurn a contrite heart. When we sincerely regret the sins we have committed, the Lord can pour His mercy upon us and bring us healing and new life. This has been the teaching of the Christian church from the beginning. But along the way we have somehow lost the true meaning of what mercy entails. How easy it is for the forces of darkness to twist the truth. They want to convince us that God is not merciful to us sinners. They want to convince us that the erroneous and immoral things we do are not really sinful. They want to convince us that God’s laws and commandments no longer apply in today’s world. They want to convince us that there are no real right or wrong standards and that truth is relative to our individual situations. Several Catholic commentators have recently written articles focusing on the distinction between true and false mercy. Since mercy is on the mind of many Catholics during this special Year of Mercy, there has arisen a concern that a flawed notion of mercy is prevalent in today’s society. The dilemma seems to be that mercy has become the catch-phrase for justifying what we want or for what makes us feel good about ourselves. Since God is all-merciful it is argued, we no longer have to worry about so-called sinful or aberrant behaviors. This is an easy distortion to make because so many people — Catholics included — want the Church to adopt a new image of God who lets us free to live however we like. This kind of thinking is off-the-track and definitely not consonant with the Gospels or the Catholic catechism. God’s laws do not change according to the times. But our lives and theology must conform to what God wants. We have a merciful redeemer — YES! We also have worldwide cultures that have become more and more promiscuous, self-regarding, relativistic and materialistic. We are the ones who have to change, to convert, to acknowledge our sins and seek God’s healing help. Our supremely merciful God will never, ever turn us away when we repent with our whole hearts and try to do better. The blackest sinners He invites to come forward and with just a sigh of repentance, the floodgates of His mercy are opened to them. No shame is too awful for the Heart of Christ to heal. And if our hearts are still hardened, if our feelings are still frozen, let us come forward, nevertheless, to the Heart of Jesus and humbly ask for the gift of contrition. Let nothing stand in the way of us approaching the merciful Heart of Christ and trusting that we will be received with love and mercy. It is impelling to read how God’s mercy has touched people’s lives. True mercy will always include the counsel that the sinner amend his or her ways. A good example of this is related in the book Redeemed by Grace written by a Catholic woman, Ramona Trevino, who spent three years working as a manager of a Planned Parenthood clinic. Like many worldly Catholics, she had a defective understanding of the Church’s moral teachings. Her job at a small facility required her to routinely hand out contraceptives and perform pregnancy testing — abortions were done at other facilities. When some girls came in and found out they were pregnant and wanted abortions, Ramona’s job was to refer them to another clinic to get one. Although this made her uneasy, she quieted her conscience by telling herself she was there to help others and had to respect their choice. Fortunately, she had the grace of a good confession and the young Mexican priest gave it to her straight: She should stop using contraceptives in her own marriage and that the place where she worked was contrary to the will of God. In fact, working there was putting her soul in danger. This truthful and compassionate approach changed Ramona’s life. She resigned her job, persuaded her last client not to have an abortion and for lack of business, the clinic was forced to close its doors. Inspired writers of Sacred Scripture have recorded for us a tremendous volume of material evincing two outstanding characteristics of God: mercy and justice. Are these two qualities contradictory? Can a gracious, merciful God really punish people? The answer lies in the revelation that our perfect God cannot allow sin to go unpunished because sin has consequences. If God is truly good, (which He is) then He cannot approve of or overlook evil. Justice and mercy are both qualities of God, yet they never contradict each other. There is a fascinating (true) story from our Eastern Orthodox brethren that hints at a secret or hidden element that, I believe, vastly influences the scales of mercy and justice meted out by our God to us poor humans. The story goes like this: One day after a prayer service in the Greek Orthodox Monastery of Vatopedi, after the monks had departed, the Abbot remained deep in prayer. He was suddenly startled by a woman’s voice coming from the narthex. Investigating, he discovered that the voice was coming from the icon of Our Lady there and he heard her say, “Do not open the monastery’s gate today, but go to the walls and get rid of the pirates.” He gazed incredulously at the icon, whose images now became alive. The Christ Child, also depicted in the icon, raised his right arm to cover Our Lady’s mouth, looking at her with a strict expression on his face. The Abbot heard Christ speak in a child-like voice, “Mother, don’t tell them. Let them be punished as they deserve because they do not keep their monastic duties.” Then Our Lady carefully lifted Christ’s hand and moved her face gently to the right, repeating her advice, “Do not open the doors of the monastery today. Go to the walls and rid the monastery of the pirates, and be sure to repent because my Son is angry with you.” She repeated her words a third time and then the images resumed their icon appearance. The Abbot, full of amazement, quickly gathered the monks and described what had happened, but they could see for themselves that the icon was now changed from the original. For six centuries, the icon has remained as it can be seen today with Our Lady’s hand restraining Christ’s hand from her mouth. This miraculous icon, not made by human hands, reminds us of Mary’s great influence over the Heart of her Son.